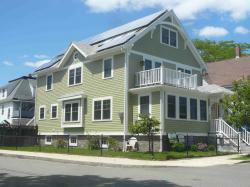 THis project completed the ACI Thousand Home Challenge in August of 2012, after 12 months of ongoing monitoring. The 11,522 kWh threshold set for the project was met at a 78% reduction of 8,936 kWh for the year. Solar domestic hot water Here are some of the highlights of the Deep Energy Retrofit of this transformed 1903 Bungalow. Attic, Roof: R-60 (10"Icynene 4" Rigid Polyiso Foam added to exterior). Walls: R-40 (4" Rigid Polyiso Foam added to exterior, 2 layers interwoven for no thermal breaks). Windows: R-5 (0.2 U-value) Paradigm triple glazed, low E, argon filled. Air leakage reduction: 85% from initial leakage 5050 cfm at 50 Pa, final 762 cfm at 50 Pa. Heating system: 96% eff Phoenix Evolution, integrating solar & back up water heating, radiant slab & hydro air. Cooling: Carrier Air to Air Heat Pumps, COP 4.08 @47*F. 2.80@17*F. Heat Recovery Ventilation: Lifebreath HRV, 88% efficient heat recovery. Lighting: Compact Flourescent or better throughout. Appliances: all ENERGY STAR. Renewables: Velux integrated Solar DHW & a 6.25 kW Solar PV w/ Sun Run Residential Power Plan. Acceptance into the ACI 1000 Home Challenge, ongoing monitoring w/ total energy threshold of 11,007 kWh/yr. This National Grid Deep Energy Retrofit project (in the final phase of construction) began in April of 2010 achieving Town approval for set back findings to add a full new 2nd floor to the project, a fully functioning attic for home offices, and a comprehensive basement renovation and new insulated radiant slab. While the original footprint of the home has not been altered with the exception of new decks, the usable space has increased 34% from 2,647 to 3,560 SF. The super insulated enclosure was substantially enhanced through financial and technical support from National Grid through a technical partnership with Building Science Corporation and the DOE's Building America Program. In addition to significantly reducing it's energy use, the building is also supplying over 50% of its annual fuel needs with Solar Electric and Solar Thermal panels, fully exposed on the south side of this highly visible corner lot with exceptional solar exposure. The combined focus on energy efficiency and renewables have earned the project a Home Energy Rating (HERS) of 26 . The home is also participating in the National Thousand Homes Challenge - an ambitious program to showcase very significant energy use reductions existing homes. Ongoing monitoring is being performed by PowerHouse Dynamics and Solar Wave Inc. This project is the first single family home of its kind to be built in Quincy. This was a unique opportunity to work with clients who wanted the best for a home they had loved and owned for 18 years in a community where they wanted to stay and raise their 3 children. They GC and sub-contractors on this project were very open to learning new systems and proud of the project as they realized how effective it was in providing the needs of the client and how effectively it met the protocol of the DER and THC programs. Directions to the open house at 2 Bromfield St, Wollaston, North Quincy MA From 93 South from Boston.Take exit 12 to merge onto Gallivan Blvd, Mass, 3A S toward Neponset /Quincy Continue to follow Mass.3A S. Slight left @ Quincy Shore Dr, right at Bromfield St. T Stop is Wollaston on Red Line. 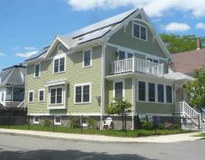 National Grid will be sponsoring an Open House showcasing a Deep Energy Retrofit with Timeless Architecture and Grifcon Contracting, for the Hall Family's new Home in Quincy, MA. The Design and Building team has been transforming a 1903 bungalow to a 4 story, state-of-the-art 21st century home. The Team includes, Building Science Corp. (Building Science & DER Specialists), Conservation Services Group (Energy Performance and Verification), Ondrick Engineering (Structural), Drew Gillette (Mechanical Engineering), Alteris Renewables (Solar Systems), Anderson Insulation, Jordan Woodworking, DL Services (HVAC and Plumbing), Taylor and Bailey Framers (Framing), AMC Electric (Electrical), Yale Appliances (Appliances and Lighting), Ferguson Plumbing (Plumbing Fixtures), Jackson Lumber (Windows and Doors) , SRW Supply, and Bradco Inc., Boston Green Building (DER Consulting). This self-described typical family of five is expanding to allow for the most efficient use of this 900 SF footprint home that was adequate when they numbered just 2. They also want to show what folks can do to maximize energy use & create teaching tools for building new, particularly when expanding makes more sense than moving.